Your window space is a great advertising opportunity. Custom window decals, window stickers, and window clings are each an attractive and practical method for capitalizing on your window space. Share your message with the world. Window decals come in a variety of standard formats and we are able to produce custom decals fit your requirements. Available in both small and larger formats, our window decals are perfect for storefront windows, point of purchase displays, mirrors, vehicle windows, glass displays, and glass tables. All of our window decals can be modified with low-tac adhesive for easy repositioning, or we can apply a more permanent glue option. Easy to install and remove, your PFL window decals are a perfect addition to your advertising efforts. Clingy can be a good thing, at least when it comes to window signage. 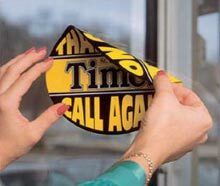 Custom window clings, often referred to as static clings, are printed on a plastic that will adhere to a window or any glass surface without the glue that decals use. The static electricity is strong enough to hold both small and large format clings to the surface. Custom window clings reposition easily and leave no residue. Call Us for a quote, 800-­930-2423. PFL is your expert source for window clings, window films, window decals, and window stickers. Call one of our knowledgeable, friendly, customer advocates to get started on your order, or Request a Price Quote. Have questions about Custom Decals or Static Clings?